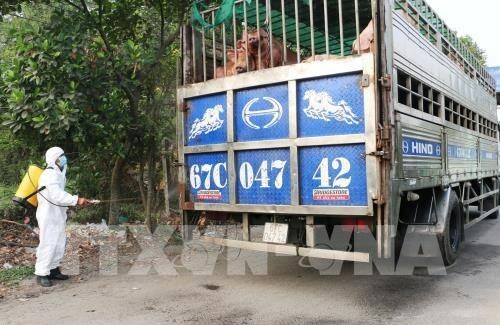 Hanoi (VNA) – As of April 10, no new cases of African swine fever (ASF) had been reported in the 12 ASF-outbreak areas over the past 30 days, according to the Department of Animal Health under the Ministry of Agriculture and Rural Development (MARD). The outbreak sites reported are Duc Hop commune (Kim Dong district), Giai Pham commune (Yen My district) and Hong Nam commune (Hung Yen city) in the northern province of Hung Yen; Dai Dong commune (Tu Ky district, Hai Duong province); Quynh Minh commune (Quynh Phu district) and Vu Tien commune (Vu Thu district) in Thai Binh province; Hop Thanh and Thanh Luong communes in Luong Son district), Hoa Binh province; Ly Chinh commune in Ly Nhan district, Ha Nam province; Ta Ma commune in Tuan Giao district, Dien Bien province; Ninh Khang commune in Hoa Lu district, Ninh Binh province; and Ngoc Thuy ward in Long Bien district, Hanoi. The northern mountainous province of Hoa Binh was the first locality nationwide to announce the eradication of ASF on April 9. Meanwhile, 22 others cities and provinces are still affected by the virus. MARD Deputy Minister Phung Duc Tien said a locality is considered rid of the disease if there have been no new outbreaks within 30 days since the last infected pig was culled. The northern mountainous province of Bac Kan is expected to become the next locality free from the disease, if it continues to register no new outbreak by April 11. The disease has been promptly controlled thanks to the timely response of the Government; Prime Minister Nguyen Xuan Phuc; the MARD; and other relevant ministries, agencies, and localities, Tien said. Since ASF was first recorded in Vietnam on February 1, 2019, the country has culled more than 85,000 pigs, according to the official.